The late great scholar Edward Said, in his monementally influential work "Orientalism" (1978) argued that Westerners were always writing about the nature Orientals in order to stress Western superiority. "the essence of Orientalism is the ineradicable distinction between Western superiority and Oriental inferiority" p 42. He traces the myth of the Orient in Orientalism, to a male dominated sexual fecundity, but at least in a negative sense he also provides his own theory of the orient. In other words this Palestian born Scholar who worked at Cornell, was an Orientalist out of the Orient. And like other Oriental orientalists Edward Said argued for a fundamental inexplicability, what Kawai had called the "empty centre" or Doi had described as a lack of independence, or Yamagishi theorises as a radical contextualism so radical that it becomes non-contextual in some contexts. Edward Said writes "not that it [orientalism] is a misrepresentation of some Oriental essence—in which I do not for a moment believe." The act of Orientalism, and by implication Westerners, have an essence: continuously narrating, and negatively judging and evaluating their outgroups in Asia, but the Orient has no such essence or essences. In the end Edward Said seems even to espouse the myth that he rejects: orientals are simply plural and corporeal, but they lack any essence, proclivities, tendencies. Asians lack self. I am an orientalist too. I argue that the Japanese at least, and probably other East Asians, have an essence remarkably similar to Westerners. They do the same sort of evaluation, but rather than narrate, they take photos, they judge evaluate by means of, and identify with, the visual, and take and imagine pictures also of themselves. It is my belief that visual self evaluation is preferable in that it is harder overly believe positive self evaluation and harder to keep it a secrete. 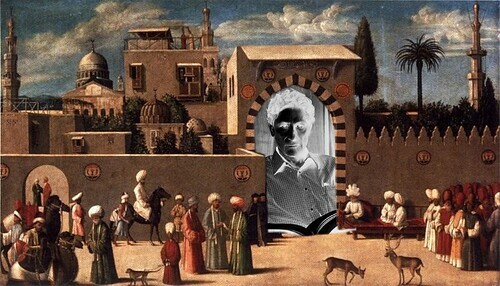 The above imagine is an amalgamation of a negative version of a portrait of Edward Said by Antoun Albert and an anonymous Venetian orientalist painting, The Reception of the Ambassadors in Damascus', 1511, the Louvre both on the Wikipedia page on Edward Said's famed monograph. Said, E. W. (1978). Orientalism. London: Routledge and Kegan Paul.